1) On tap first, apparently there is more to curling than simply ice, rocks, brooms, and ferocious screaming. The Norwegian mens team has created a stir in Vancouver this week at one of the most popular local events, by wearing matching plaid pants from Sonoma, CA outfitter Loudmouth Golf. During NBC coverage (below), Meredith Viera called them "the pants heard 'round the world." Hyperbole aside, people have been taken by surprise because curling pants are traditionally black, by rule of the World Curling Federation. As a result, the pants have garnered such a ridiculous amount of buzz that they have been featured on NBC, USA Today, and NPR, as well as several social networking sites. Is this the sign of a very slow week at the Winter Games? Nothing like staring at Al Roker's pants. The extra attention for such a staid sport has served the team well. The pants are 2-1 through three games in the opening round-robin of the men's tournament. 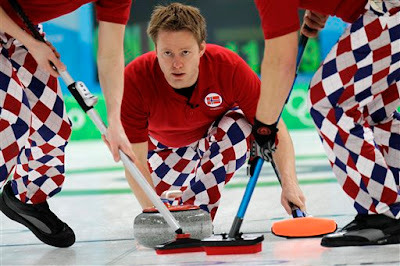 Norway's curling team won the gold in Salt Lake City in 2002 and placed fourth in the Turin Games in 2006. 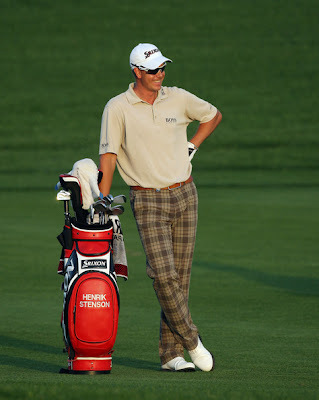 2) No stranger to plaid pants himself, PGA Tour golfer Henrik Stenson earned $45,000 yesterday for playing one hole at the WGC Accenture Match Play Championship. The Swede, who is currently ranked 10th in the world, was beset by flulike symptoms before the start of his opening round match against American Ben Crane. on his way to an 8th place finish. According to the rules, if Stenson had withdrawn from the tournament, he would have not received any prize money. By competing for one hole and then conceding, however, he was able to walk away with a nice check for 33rd place and a cool 45k. sans pants, at a tournament in 2009. Interesting side note to this story: the PGA Tour's press release regarding the incident makes no mention of Stenson's claim to the prize money. Instead, the release states, "There was no way [Stenson] was going to be able to play...but Stenson didn't want to withdraw since [playing in] the tournament would count toward fulfilling his [PGA Tour] membership requirement of 15 starts on the PGA Tour and 11 on the European Tour." The release also notes (the strange coincidence?) that his wife is about to give birth to their second child in Orlando, FL. For all intents and purposes, Stenson is legitimately sick and I think it is utterly important for him to be there to support his wife, but I do find it curious that the PGA Tour narrative - "Ailing Stenson concedes, heads home to Orlando for baby's birth" - stands in stark contrast to the Golf Channel's "Stenson walks because money talks." Because no one can fault an ailing man for returning home to his pregnant wife, but walking away with $45,000 for roughly ten minutes of work doesn't quite sit as well. 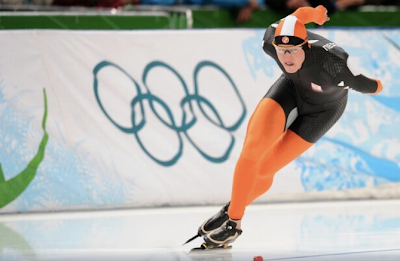 3) Finally, when Olympic speed skater Sven Kramer won his first gold medal this week in the men's 5000 meters the 23 year-old Dutchman, and world record holder in the event, was ecstatic. The gold medal had been elusive for Kramer, with a number of miscues - a fall and a skate malfunction - costing him a place atop the medal stand in Turin in 2006. The Flying Dutchman, a national hero, delivered in the 5000 meters. Considering the rock star status for speed skaters in the Netherlands, where speed skating is life and Kramer is a god, the post-race interview with NBC left him a bit incredulous when the interviewer made the following bizarre request: "I need you to say your name and your country and the medal you just won here." 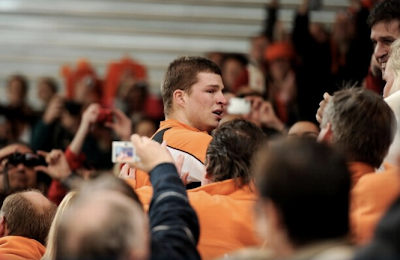 raced into the stands to celebrate with his family and friends. Turns out Kramer is not the only Olympic athlete upset with the job NBC is doing covering the Olympics. 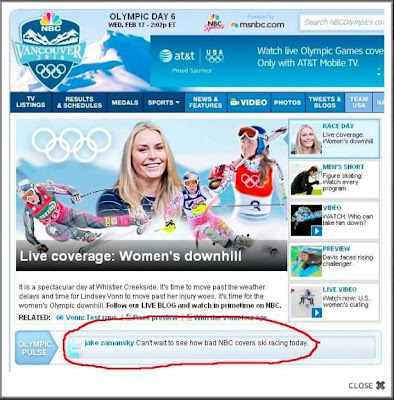 US skier Jake Zamansky posted the following Tweet, "Can't wait to see how bad NBC covers ski racing today," which was then reverberated on the NBC Olympics home page. Guess how long it took for NBC to ban Jake Zamansky Tweets. The backlash over NBC's Olympic coverage - which is tape delaying events from 3 and up to 12 hours after they've occurred - has enraged viewers and media personnel alike. From the Seattle Times and the Seattle Post-Intelligencer, to The Atlantic, the Boston Globe, the Huffington Post, Sports Illustrated, and Deadspin, media sites are weighing in on the issue - especially those on the Northwest Coast, whose feeds are tape delayed longer than the rest of the country. And it's tough not to side with Zamansky, when events like downhill skiing - one of the Olympics more thrilling events - is tape delayed up to eight hours after it occurs. 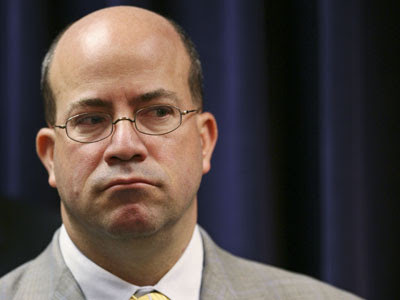 responsible for the Conan/Leno fiasco. Unfortunately for devotees of live sport, the strategy is working well for NBC, with improved ratings over the Turin games thus far, including a Wednesday night telecast that beat out ratings behemoth American Idol by over 12 million viewers (30 million to 18 million). On that day, what NBC called "the greatest single day in Winter Olympics history," the United States captured six medals - including golds from media darlings Shaun White, Lindsey Vonn, and Shani Davis. It was the first time in six years that American Idol had lost out in TV ratings. So, which is the sports story that you care least about this week?